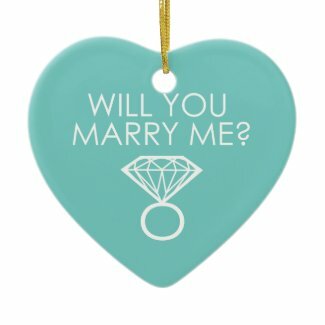 Looking for a unique way to pop the question this Christmas? 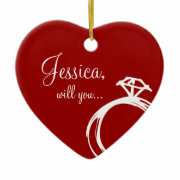 Here are some great proposal ideas using these wonderful products from Zazzle. Loop the engagement ring through the ornament's string. Hang on Christmas tree for your bride-to-be to find Christmas morning. Another idea is to decorate the Christmas tree together... she will be surprised when she pulls out the engagement ornament to hang on the tree. Present your engagement ring to that special someone with one of these gorgeous gift boxes. What are some other unique ideas for proposing on Christmas? These are such great ideas to make a marriage proposal even more special and memorable. Thanks for including my entwined hearts gift box!